Please check us out on Face Book and “like us”! Please note that to enter your horse into the CPHA Green Hunter Incentive Program is only $250.00 until March 1st and then it goes up to $450.00. The PCHA/CPHA banquets were a great success to all of you who came to support our honorees. Hall of Fame: Nick Karazissis, Sr. The Southern California Style of Riding Championships held at Hit’s Sunshine Series II was a huge success with 46 starting the field. Thank you to Hits for a job well done. The WCE at the Las Vegas National Horseshow was a very special venue for our riders. Thank you to Blenheim for this great event. The first Style of Riding Championships were held at the Silicon Valley Horse Show in Woodside, CA hosted by WPEM. We would like to congratulate the winner of the class. Congratulations to our Green Incentive Hunters and riders. The Championships were held at Blenheim Equisports in San Juan Capistrano and were full of beautiful young horses. Blenheim hosted a very nice breakfast for all. The class winnings were over $30,000.00. The three horses and three riders with the most cumulative points during the qualifying period received cash bonuses. Congratulations to our champions of the Junior/Amateur Medal finals. Please read the attached press release. The CPHA Style of Riding Specifications have been updated! Please check on the medals page for recent clarifications. There was a lot of confusion regarding this class and I hope these updated specs will clarify any confusion. They are in effect immediately. Remember you only need ride in one qualifying class prior to the championships to participate in the class. Zoe Brown trained by Harley Brown. Thank you to all who participated. It was very successful and will help so much to support those that are in need. A special thanks to Beth and Anthony for donating their winnings back to the Foundation to go into the Aid Fund. Congratulations to our Northern California Child-Adult and Horsemanship Champions! We had a great event for the exhibitors who qualified and rode in the finals held at Sonoma Horse Park. Thank you to Sally Hudson and Ashley Herman for their support of this event. The contributed lovely flowers and ribbons to the top 10! If you would like to nominate someone or an equine for one of our prestigious year end awards please download, fill out and send in the nomination form. You may fax, email or mail. Nominations due by October 15, 2019! The forms are on the Year End Honors Tab. TIME to Renew your 2018 membership; If you have not renewed your membership it’s time to get that done. Please note if your name is on the roster on the website you are a current member regardless of the date. Rider and Trainer must be current CPHA members to participate in any CPHA class prior to competing. Horses must be registered only if you are competing in the green incentive classes. Thank you to everyone who has stepped up to help our fire victims. It has been a devastating time for many and thru the CPHA Foundation we raise funds to help those who have lost so much. If you are one of those still in need please go to the Foundation page and fill out an application for aid. Please review the medal schedule so you don’t miss any of our finals. Look at the standings page and see how many points you have. If you think you are missing any points just call the office or email your concerns to info@cpha.org. In September the Green Incentive Championships will show off all of the great green horses we have in California. Not too late to enroll, just check out the information on the home page under: Green Incentive Program. Remember your horse must be registered under your membership and the rider, owner and trainer must all be current CPHA members. This is an incentive program which means the monies collected will go back to the participants. The Wasserman Foundation will be sponsoring this event along with Blenheim Equisports this year so a huge thanks to both of them. For our year end banquet this year it will be held in San Diego so mark your calendars for January 4-6, 2019. If you would like to nominate someone for a year end award please check out the criteria for the awards we give out and send in your nominations. You can find them on the Year End Awards Tab. Neil Gray, DVM is one of our professional members working on the Equitarian Initiative, a charity organization that provides veterinary care to working equids (horses, mules and donkeys)in underserved communities in developing countries. These horses need your help so please read about the worthwhile project and help these wonderful horses who are so deserving and get so little help. The date of your membership will reflect the date of the show you earned your points in. Make sure your trainer is a current CPHA Member prior to your participation in a CPHA class. 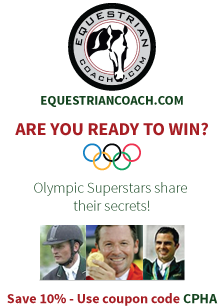 Be sure and visit DaMoor's Feed & Tack who sponsor many gifts towards all of our medal finals. Thank you very much. In memory of Chelsea Weaver there is a fund to help out those who need financial help to attend clinics. Please send an email requesting aid to go to a clinic to info@CPHA.org. Include your name, address, phone number, CPHA #, name, date and location of clinic and amount of aid requested." This fund is from the CPHA Foundation. The CPHA Foundation offers aid to professionals in need. Please visit the Foundation page for further information and the application.